Exclusive Interview with Richelle Mead! Richelle Mead is definitely not a woman that needs an introduction. As the author of the widely popular Vampire Academy series, she is known to nearly every vampire fan out there. I was lucky enough to chat with Richelle on the end of Vampire Academy, the beginning of Bloodines, and much more! Many of our readers are incredibly sad that the Vampire Academy series is over, how did it feel to end the series? Probably not as sad for me as for everyone else! It’s definitely hard to end a series you’ve put so much work into, absolutely. But, when I first set out to write it, I always knew how the story was going to end, so there was a certain “rightness” about wrapping things up in Last Sacrifice. Besides, thanks to Bloodlines, we’re not entirely leaving that world! In some ways, I don’t even feel like VA is ending. It’s just transforming. 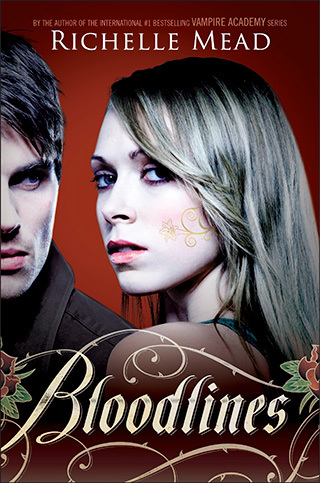 While your fans are sad that Vampire Academy is over, they’re pretty geeked about your new series, Bloodines. Can you tell us a little about it? Bloodlines takes place right after the events of Last Sacrifice. The narrator of the story is Sydney the Alchemist, so we’ll get to see the vampire world through the eyes of a human. It takes place in southern California, which is sunny and fun for humans—but not for vampires. Will there be any familiar characters in Bloodlines? Lots! The main characters will be Sydney, Jill, Eddie, and Adrian. You can also expect a few cameos from some other favorites from the Vampire Academy series. There is a Vampire Academy graphic novel coming this summer (yay! ), can you tell us about that project? It’s a graphic novel adaptation of the first book in the VA series and will be out at the end of August. Like all adaptations, a few parts were cut, but I worked with them on the script to make sure all the key elements stayed. Emma Vieceli is doing the art for it (and future volumes) and has done a really beautiful job. Ok, here’s a question I ask all folks I interview: I’ve noticed that most of the authors I follow on Twitter talk about the music they’re currently writing to. What kind of setting/atmosphere do you find most conducive to your writing? I actually don’t listen to music while I write! The setting most conducive to writing for me is a calm one without much noise. If music’s playing, I get distracted and start listening to those words, not my own. I need to be able to totally focus on the project I’m working on. What is your favorite vampire book/movie/show? Of the few vampire books I’ve read, probably Rachel Caine’s Morganville Vampires series is my favorite. I’ve only read a couple of them, but I just love her writing style. I’m a big fan of her Weather Warden series too. She’s one of those incredible writers who can run with any topic and make it fun to read. I hear that you are part of a project which helps the victims in Japan. Can you tell us about it and what our readers can do to help? It’s actually a group of authors who have donated autographed books for sale on eBay. All the proceeds go to charities that the individual authors choose, though all are groups that are doing work in Japan. Some of the charities include the American Red Cross, Shelterbox, and Doctors Without Borders. The seller name is “booksthatgive”, and those who are interested can do a search on eBay to see what’s currently listed. Most of my time is spent rotating between my three series. In addition to Vampire Academy/Bloodlines, I also write two adult series—Dark Swan and Georgina Kincaid. Both of those are wrapping up soon, so I’m working on those endings, along with polishing up Bloodlines. Eventually, I’ll probably start another adult series, but I haven’t given that much thought yet! One thing that readers can look forward to is Vampire Academy: The Ultimate Guide, which is coming out in November. Author Michelle Rowen is doing most of the work on it, and it’s going to be a really fun compilation of all sorts of info from the VA world. Richelle Mead Books » Blog Archive » Nova entrevista com a Richelle. OMG i love vampire academy books just start reading them, i can’t put them down the are so good. i’m onto the 4th book i cryed when damittri turned :( can’t wait till Blood line is out!!!! !